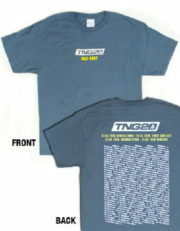 This is a bluish grey t-shirt bearing the Star Trek: The Next Generation 20th Anniversary logo on the front, and a listing of all 178 episodes and 4 movies on the back. This is a new, never worn t-shirt. This is a clear glass bowl featuring the image of the classic Star Trek The Original Series command logo, set in space, at the bottom. 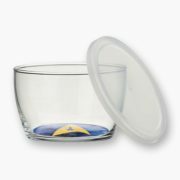 It measures 4.5″ in diameter at the top and comes with a seal tight plastic lid to protect whatever you might store in it. It has a photo quality design, is stored in a smoke and pet free environment and hand wash is recommended. 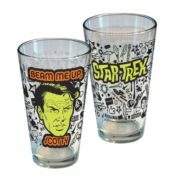 This is a 16 ounce pint glass featuring the image of Captain Kirk in a Tokyo wrap style with the words “Beam Me Up Scotty” from the classic Star Trek The Original Series. It is a new and unused pint glass, has a photo quality design and hand wash is recommended. Produced by NMR in 2014, this is a licensed 3-D die-cut magnet measuring approximately 3″ tall x 4″ long that features the USS Enterprise and the Command Insignia from Star Trek: The Original Series. This is a new, never used, magnet made of composite materials. 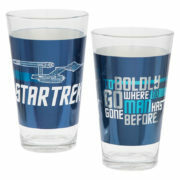 This is a set of two 16 ounce pint glasses featuring laser decal images of the classic original Star Trek series Enterprise on one and the opening monologue (To Boldly Go) on the other. These are new and unused pint glasses packed in an illustrated open window gift box and stored in a smoke and pet free environment. Hand wash is recommended. 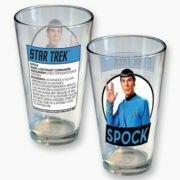 This is a 16 ounce pint glass featuring the image of Mr. Spock on the front giving the Vulcan salute from the classic Star Trek The Original Series. On the back is bio information about him. 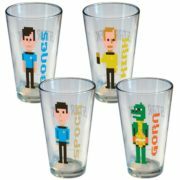 This is a set of four 16 ounce pint glasses bearing the pixelated name and images of Kirk, Spock, Bones and Gorn from the famous Star Trek: The Original Series. It is a new and unused pint glass set, has a photo quality design and hand wash is recommended. 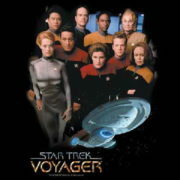 This is a black t-shirt bearing an image of the crew from the seventh season of Star Trek: Voyager above the name logo and the ship. This is a new, unworn t-shirt. 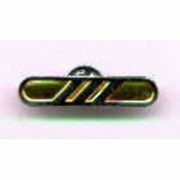 This 1.75″ x 2″ cloisonne pin is a reproduction of the communicator pins worn by Starfleet members on Star Trek: Voyager, the last two years of Star Trek: Deep Space Nine, and all of the Star Trek: The Next Generation movies. This is a new, unused, mint condition pin made by the Hollywood Pins Company. It has had limited release and is not easily found outside of Star Trek conventions. Hollywood Pins closed down in October 2001 so this pin will soon be next to impossible to find. It has been stored in a smoke and pet free environment. This 1.125″ wide cloisonne pin is a 1/2 size reproduction of the communicator pins worn by Starfleet on Star Trek Voyager, the last two years of Star Trek: Deep Space Nine, and all of the Star Trek: The Next Generation movies. This is a new, unused, mint condition metal cloisonne pin made by the Hollywood Pins Company. It has had limited release and is not easily found outside of Star Trek conventions. Hollywood Pins closed down in October 2001 so this pin will soon be next to impossible to find. This is stored in a smoke and pet free environment. Produced by Hollywood Pins, this pin features the rank logo of a Commander of the renegade organization, The Maquis, as seen on both Star Trek: Deep Space Nine and Star Trek: Voyager. 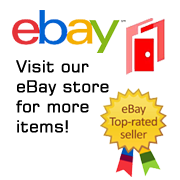 It measures 1 9/16″ across and is a mint, unworn cloisonne pin. 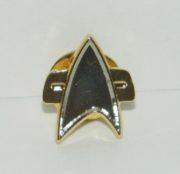 Produced by Hollywood Pins, this pin features the rank logo of a Lieutenant Commander of the renegade organization, The Maquis, as seen on both Star Trek: Deep Space Nine and Star Trek: Voyager. It measures 1 9/16″ across and is a mint, unworn cloisonne pin, now out of production. Produced by Hollywood Pins, this pin features the logo of the renegade organization, The Maquis, as seen on both Star Trek: Deep Space Nine and Star Trek: Voyager. This .563″ wide cloisonne pin is a 1/4 size reproduction of the communicator pins worn by Starfleet on Star Trek Voyager, the last two years of Star Trek: Deep Space Nine, and all of the Star Trek: The Next Generation movies. This is a new, unused, mint condition pin made by the Hollywood Pins Company. It has had limited release and is not easily found outside of Star Trek conventions. Hollywood Pins closed down in October 2001 so this pin will soon be next to impossible to find. This is stored in a smoke and pet free environment. This .875″ wide metal enamel pin in a gold tone color is a reproduction of the communicator pins worn by Starfleet on Star Trek Voyager, the last two years of Star Trek: Deep Space Nine, and all of the Star Trek: The Next Generation movies. This is a new, unused, mint condition pin made Lincoln Enterprises years ago and now out of production. It has been stored in a smoke and pet free environment. This .875″ wide metal enamel pin in a silver tone color is a reproduction of the communicator pins worn by Starfleet on Star Trek Voyager, the last two years of Star Trek: Deep Space Nine, and all of the Star Trek: The Next Generation movies. This is a new, unused, mint condition pin made Lincoln Enterprises years ago and now out of production. It has been stored in a smoke and pet free environment. 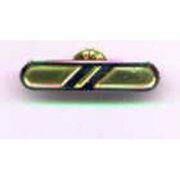 This 1.75″ x 2″ cloisonne pin is an exact reproduction of the communicator pins worn by the cadets at Star Fleet Academy on Star Trek: Voyager, the last two years of Star Trek: Deep Space Nine, and all of the Star Trek: The Next Generation movies. It is exactly like the communictor pin worn by the officers of Starfleet except that theirs has gold trim around the silver chevron and this one has an all silver chevron. This is a new, unused, mint condition pin made by the Hollywood Pins Company and stored in a smoke and pet free environment. It has had limited release and is not easily found outside of Star Trek conventions. Hollywood Pins closed down in October 2001 so this pin will soon be next to impossible to find. 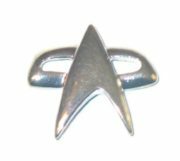 This 1.5″ wide enamel metal pin reproduces the image of the Starship Voyager coming out of warp and underneath the name of the hit series Star Trek: Voyager. This is a new, unused, mint condition pin made by the Hollywood Pins Company in 1995. It has had limited release and is not easily found outside of Star Trek conventions. Hollywood Pins closed down in October 2001 so this pin will soon be next to impossible to find. This is a set of four thick cloisonne metal rank pips. These pips are like the ones worn on the 5th-7th seasons of Star Trek: Deep Space Nine, and on all of the episodes of Star Trek: Voyager, and all of the Star Trek: The Next Generation movies. This 3″ wide by 1.25″ tall enamel metal pin features the image of the name and communicator command logo as first seen on the Star Trek: Voyager TV series. This is a mint, never used licensed pin that comes in a sealed package with a header card. 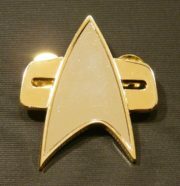 This pin is not easily found outside of Star Trek conventions due to low distribution. This is a small thick metal black rank pip seen on Star Trek. These pips are like the ones worn on the 5th-7th seasons of Star Trek: Deep Space Nine, and on all of the episodes of Star Trek: Voyager, and all of the Star Trek: The Next Generation movies. Produced by Hollywood Pins, this cloisonne metal pin features the image of the Voyager starship, as seen on Star Trek: Voyager. It measures 1.75″ across and is a new, unused, mint condition pin made by the Hollywood Pins Company. Produced by ATA BOY in 2012, this is a licensed magnet measuring 2 1/2″ by 3 1/2″ that features the image of the Enterprise on a blue background from Star Trek: The Original Series. This is a new, never used, magnet.